The College welcomed a thought-provoking art exhibit to the Duluth campus on Tuesday, March 5, with the opening of The Disability Mural Project in the Student Union on the ground floor of Tower Hall. The Disability Mural Project is a collective artwork made up of individual 12-inch by 12-inch paintings created by people with disabilities, their caregivers and family members. More than 350 paintings were created in the Northland's version of the project. The current exhibition, which marks the first time the artwork has been publicly displayed, presents 100 of them, with the entire group of works accessible in an ongoing slide show. 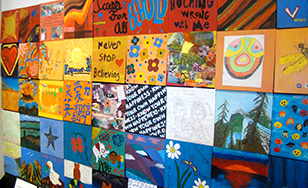 The mural and exhibition are a project of students in "Art as an Expression of Dignity," a class in the Dignitas program, St. Scholastica's program for first-year students. Dignitas explores the meanings of human dignity in the context of St. Scholastica's Catholic Benedictine values. The mural's purpose is to help observers consider the unique perspectives and experiences of individuals who live with disability. Educational themes include Person First language, Universal Design and the Social Model of Disability. Local television station KBJR-TV Channel 6 covered the opening of the exhibition. Duluth Mayor and St. Scholastica alumna Emily Larson visited the display. The College will host a free public reception from 6:30 to 8 p.m. Thursday, March 21, in the Student Union. The mural is on display through March 28.